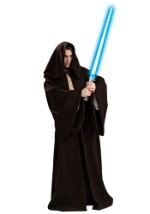 You'll be using the Force for good this Halloween in one of our Jedi costumes! We've got you covered, with both adult and child Star Wars Jedi costumes. No serious Jedi will travel the galaxy without a robe! You can complete any Jedi character costume with our Jedi items. We have lots of accessories, too, so you can add a lightsaber and a pair of matching boots to your robe and costume this Halloween.